Each mL of VASOVIST Injection contains 244 mg gadofosveset trisodium (equivalent to 0.25 mmol/mL) and is available in single-use vials (3). Nephrogenic Systemic Fibrosis may result from administration of gadolinium-based contrast agents to certain patients (5.1). Gadolinium-based contrast agents, including VASOVIST may increase the risk for acute renal failure in patients with a history of renal insufficiency (5.3). QTc prolongation has been reported following VASOVIST administration. Assess patients for a history of underlying conditions that may predispose to arrhythmias due to QTc prolongation (5.4). VASOVIST is indicated for use as a contrast agent in magnetic resonance angiography (MRA) to evaluate aortoiliac occlusive disease (AIOD) in adults with known or suspected peripheral vascular disease [see Clinical Studies (14)]. Administer VASOVIST as an intravenous bolus injection, manually or by power injection, at a dose of 0.12 mL/kg body weight (0.03 mmol/kg) over a period of time up to 30 seconds followed by a 25-30 mL normal saline flush. (See Table 1 for weight-adjusted dose volumes). Inspect the VASOVIST vial visually for particulate matter and discoloration prior to administration. Do not use the solution if it is discolored or particulate matter is present. VASOVIST is intended for single use only and should be used immediately upon opening. Discard any unused portion of the VASOVIST vial. Do not mix intravenous medications or parenteral nutrition solutions with VASOVIST. Do not administer any other medications in the same intravenous line simultaneously with VASOVIST. VASOVIST imaging is completed in two stages: the dynamic imaging stage and the steady-state imaging stage. Both stages are essential for adequate evaluation of the arterial system, and dynamic imaging always precedes steady-state imaging. During interpretation of the steady-state images, VASOVIST within the venous system may limit or confound the detection of arterial lesions. To assess the initial distribution of VASOVIST within the arterial system, begin dynamic imaging immediately upon injection. Begin steady state imaging after dynamic imaging has been completed, generally 5 to 7 minutes following VASOVIST administration. At this time point, VASOVIST is generally distributed throughout the blood. In clinical trials, steady-state imaging was completed within approximately one hour following VASOVIST injection. Gadolinium-based contrast agents increase the risk for nephrogenic systemic fibrosis (NSF) in patients with acute or chronic severe renal insufficiency (glomerular filtration rate <30 mL/min/1.73m2) and in patients with acute renal insufficiency of any severity due to the hepato-renal syndrome or in the perioperative liver transplantation period. In these patients, avoid use of gadolinium-based contrast agents unless the diagnostic information is essential and not available with non-contrast enhanced MRA. For patients receiving hemodialysis, physicians may consider the prompt initiation of hemodialysis following the administration of a gadolinium-based contrast agent in order to enhance the contrast agent's elimination. VASOVIST binds to blood albumin and use of a high-flux dialysis procedure is essential to optimized VASOVIST elimination in patients receiving chronic hemodialysis. The usefulness of hemodialysis in the prevention of NSF is unknown [see Boxed Warning and Clinical Pharmacology (12.3)]. Post-marketing reports have identified the development of NSF following single and multiple administrations of gadolinium-based contrast agents. These reports have not always identified a specific agent. Prior to marketing of Vasovist®, where a specific agent was identified, the most commonly reported agent was gadodiamide (OmniscanTM), followed by gadopentetate dimeglumine (Magnevist®) and gadoversetamide (OptiMARK®). NSF has also developed following sequential administrations of gadodiamide with gadobenate dimeglumine (MultiHance®) or gadoteridol (ProHance®). The number of post-marketing reports is subject to change over time and may not reflect the true proportion of cases associated with any specific gadolinium-based contrast agent. Screen all patients for renal dysfunction by obtaining a history and/or laboratory tests. 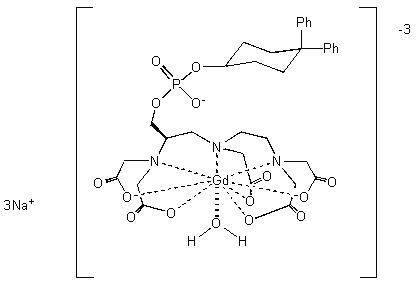 When administering a gadolinium-based contrast agent, do not exceed the recommended dose and allow a sufficient period of time for elimination of the agent prior to any re-administration. NSF was not reported in clinical trials of VASOVIST [see Clinical Pharmacology (12) and Dosage and Administration (2)]. VASOVIST may cause anaphylactoid and/or anaphylactic reactions, including life-threatening or fatal reactions. In clinical trials, anaphylactoid and/or anaphylactic reactions occurred in two of 1676 subjects. If anaphylactic or anaphylactoid reactions occur, stop VASOVIST Injection and immediately begin appropriate therapy. Observe patients closely, particularly those with a history of drug reactions, asthma, allergy or other hypersensitivity disorders, during and up to several hours after VASOVIST administration. Have emergency resuscitative equipment available prior to and during VASOVIST administration. In patients with renal insufficiency, acute renal failure requiring dialysis or worsening renal function have occurred with the use of other gadolinium agents. The risk of renal failure may increase with increasing dose of gadolinium contrast. Screen all patients for renal dysfunction by obtaining a history and/or laboratory tests. Consider follow-up renal function assessments for patients with a history of renal dysfunction. No reports of acute renal failure were observed in clinical trials of VASOVIST [see Clinical Pharmacology (12.3)]. In clinical trials, a small increase (2.8 msec) in the average change from baseline in QTc was observed at 45 minutes following VASOVIST administration; no increase was observed at 24 and 72 hours. A QTc change of 30 to 60 msec from baseline was observed in 39/702 (6%) patients at 45 min following VASOVIST administration. At this time point, 3/702 (0.4%) patients experienced a QTc increase of > 60 msec. These QTc prolongations were not associated with arrhythmias or symptoms. In patients at high risk for arrhythmias due to QTc prolongation (e.g., concomitant medications, underlying cardiac conditions) consider obtaining baseline electrocardiograms to help assess the risks for VASOVIST administration. If VASOVIST is administered to these patients, consider follow-up electrocardiograms and risk reduction measures (e.g., patient counseling or intensive electrocardiography monitoring) until most VASOVIST has been eliminated from the blood. In patients with normal renal function, most VASOVIST was eliminated from the blood by 72 hours following injection [see Clinical Pharmacology (12.3)]. Anaphylaxis and anaphylactoid reactions were the most common serious reactions observed following VASOVIST injection administration [see Warnings and Precautions (5.2)]. In all clinical trials evaluating VASOVIST with MRA, a total of 1,676 (1379 patients and 297 healthy subjects) were exposed to various doses VASOVIST. The mean age of the 1379 patients who received VASOVIST was 63 years (range 18 to 91 years); 66% (903) were men and 34% (476) were women. In this population, there were 80% (1100) Caucasian, 8% (107) Black, 12% (159) Hispanic, 1% (7) Asian, and < 1% (6) patients of other racial or ethnic groups. Table 2 shows the most common adverse reactions (≥1%) experienced by subjects receiving VASOVIST at a dose of 0.03 mmol/kg. Following injection, VASOVIST binds to blood albumin and has the potential to alter the binding of other drugs that also bind to albumin. No drug interaction reactions were observed in clinical trials. Consider the possibility of VASOVIST interaction with concomitantly administered medications that bind to albumin. An interaction may enhance or decrease the activity of the concomitant medication [see Clinical Pharmacology (12.3)]. In a clinical trial of 10 patients receiving a stable dose of warfarin, a single dose of VASOVIST (0.05 mmol/kg) did not alter the anticoagulant activity of warfarin as measured by the International Normalized Ratio (INR). There are no adequate and well-controlled studies of VASOVIST in pregnant women. In animal studies, pregnant rabbits treated with gadofosveset trisodium at doses 3 times the human dose (based on body surface area) experienced higher rates of fetal loss and resorptions. Because animal reproduction studies are not always predictive of human response, only use VASOVIST during pregnancy if the diagnostic benefit justifies the potential risks to the fetus. In reproductive studies, pregnant rats and rabbits received gadofosveset trisodium at various doses up to approximately 11 (rats) and 21.5 (rabbits) times the human dose (based on body surface area). The highest dose resulted in maternal toxicity in both species. In rabbits that received gadofosveset trisodium at 3 times the human dose (based on body surface area), increased post-implantation loss, resorptions, and dead fetuses were observed. Fetal anomalies were not observed in the rat or rabbit offspring. Because pregnant animals received repeated daily doses of VASOVIST, their overall exposure was significantly higher than that achieved with a single dose administered to humans. It is not known whether gadofosveset is secreted in human milk. Because many drugs are excreted in human milk, caution should be exercised when VASOVIST is administered to a woman who is breastfeeding. The risks associated with exposure of infants to gadolinium-based contrast agents in breast milk are unknown. Limited case reports indicate that 0.01 to 0.04% of the maternal gadolinium dose is excreted in human breast milk. Studies of other gadolinium products have shown limited gastrointestinal absorption. These studies were conducted with gadolinium products with shorter half-lives than VASOVIST. Avoid VASOVIST administration to women who are breastfeeding unless the diagnostic information is essential and not obtainable with non-contrast MRA. The safety and effectiveness of VASOVIST in patients under 18 years of age have not been established. The risks associated with VASOVIST administration to pediatric patients are unknown and insufficient data are available to establish a dose. Because VASOVIST is eliminated predominantly by the kidneys, pediatric patients with immature renal function may be at particular risk for adverse reactions. VASOVIST Injection has been administered to humans up to a dose of 0.15 mmol/kg (5 times the clinical dose). No VASOVIST overdoses were reported in clinical trials. In the event of an overdose, direct treatment toward the support of all vital functions and prompt institution of symptomatic therapy. Gadofosveset has been shown to be removed by hemodialysis using a high flux dialysis procedure [see Clinical Pharmacology (12.3)]. Distribution: The mean volume of distribution at steady state for gadofosveset was 148 ± 16 mL/kg, roughly equivalent to that of extracellular fluid. A significant portion of circulating gadofosveset is bound to plasma proteins. At 0.05, 0.5, 1 and 4 hours after injection of 0.03 mmol/kg the plasma protein binding of gadofosveset ranges from 79.8 to 87.4%. Excretion: Gadofosveset is eliminated primarily in the urine with approximately 83.5% of an injected dose excreted in the urine over 14 days. Ninety-four percent (94%) of urinary excretion occurs in the first 72 hours. A small portion of gadofosveset dose is recovered in feces (approximately 4.7%). Renal Insufficiency: Administration of gadolinium-based contrast agents, including VASOVIST to patients with severe renal insufficiency increases the risk for NSF. Administration of these agents to patients with mild to moderate renal insufficiency may increase the risk for worsened renal function [see Warnings and Precautions (5.1 and 5.3)]. Prior to use of VASOVIST in these patients, ensure that no satisfactory diagnostic alternatives are available. In patients with moderate to severe renal impairment (glomerular filtration rate < 60 mL/kg/m2), administer VASOVIST at a dose of 0.01 mmol/kg to 0.02 mmol/kg. Consider follow-up renal function assessments following VASOVIST administration to any patients with renal insufficiency. Long-term animal studies have not been performed to evaluate the carcinogenic potential of gadofosveset. Gadofosveset was negative in the in vitro bacterial reverse mutation assay, in vitro CHO chromosome aberration assay, and the in vivo mouse micronucleus assay. Administration of up to 1.5 mmol/kg (8.3 times the human dose) to female rats for 2 weeks and to male rats for 4 weeks did not impair fertility [see Use in Specific Populations (8.1)]. Safety and efficacy of VASOVIST were assessed in two multi-center, open-label, Phase 3 clinical trials. In both trials, patients with known or suspected peripheral vascular disease underwent MRA with and without VASOVIST as well as catheter-based X-ray arteriography. Diagnostic efficacy was based upon comparisons of sensitivity and specificity between MRA with and without VASOVIST, with X-ray arteriography as the reference standard. Out of 493 patients enrolled in these two trials, 424 were included in the comparison of the diagnostic efficacy of VASOVIST-MRA to that of non-contrast MRA in detection/exclusion of occlusive vascular disease (≥ 50% stenosis) in 7 vessel-segments in the aortoiliac region. The interpretation of MRA images from both trials was conducted by three independent radiologist readers who were blinded to clinical data, including the results of X-ray arteriography. In these 424 patients, the median age was 67 years with a range of 29 to 87 years; 58% of the patients were over 65 years of age; 83% were white and 68% were male. The primary efficacy analyses were designed to demonstrate superiority in sensitivity and non-inferiority in specificity of VASOVIST-MRA as compared to non-contrast MRA at the vessel-segment level. The uninterpretable images were assigned an outcome of "wrong diagnosis". Additionally, success was also based upon acceptable performance characteristics for the uninterpretable non-contrast MRA vessel segments that became interpretable following VASOVIST administration. Specifically, the sensitivity and specificity for these VASOVIST images were required to exceed 50%. These pre-specified success criteria were to be achieved by at least the same two readers for all primary analyses. Superiority in sensitivity and non-inferiority in specificity was demonstrated for VASOVIST-MRA by all three blinded readers. On average, 316 vessel segments were assessed for sensitivity and 2230 for specificity, by each reader. Table 4 summarizes the efficacy results, by reader. Among the three readers, 5 to 12% of the vessel-segments were deemed uninterpretable by non-contrast MRA. For these vessel segments, sensitivity of VASOVIST-MRA ranged from 72% [95% CI (54%, 90%)] to 97% [95% CI (93%, 100%)] and specificity ranged from 72% [95% CI (67%,76%)] to 84% [95% CI (81%, 88%)]. Store VASOVIST Injection at 25°C (77°F: excursions permitted to 15 to 30°C [59 to 86°F]). Protect from light and freezing. Gadolinium-based contrast agents, including VASOVIST, increase the risk for NSF in patients with severe renal insufficiency or acute renal insufficiency of any severity due to the hepato-renal syndrome or in the perioperative setting of liver transplantation. Patients with less severe renal insufficiency who receive repetitive administrations of a gadolinium-based contrast agent may have an increased risk for the development of NSF, especially if the time interval between the administrations precludes clearance of the previously administered contrast agent from the body. If VASOVIST is administered in these situations, instruct patients to contact their physician or healthcare provider if they develop signs or symptoms of NSF, such as burning, itching, swelling, scaling, hardening and tightening of the skin, red or dark patches on the skin, stiffness in joints with trouble moving, bending or straightening of the arms, hands, legs, or feet, pain deep in the hip bones or ribs, or muscle weakness [see Warnings and Precautions (5.1)]. Labeler - Bayer Healthcare, Inc.